As for the previous events in the series, the symposium was preceded by a half-day tutorial session with four lectures given by P. Simon, W. Sugimoto, T. Brousse and J. Miller on a updated state of the art in the field. 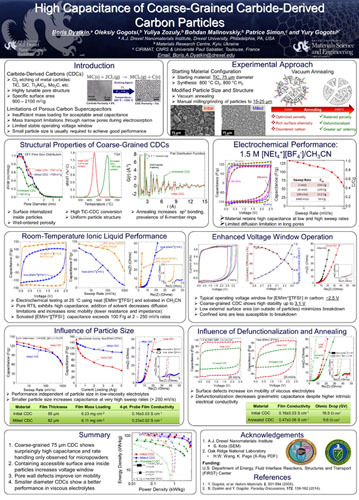 At the 4th International Symposium on Enhanced Electrochemical Capacitors, ISEE'Cap in poster session B.Dyatkin, Drexel University (USA) presented the results of joint work describing high capacitance of coarse-grained carbide-derived carbon particles. Most conventional supercapacitor electrode materials implement micrometer (1-10um) or nanometer (5-100 nm) size carbon particles with finely tuned porosities and high accessible specific surface areas. We present a novel internal surface area electrode with 50-100 um diameter particles, a finely tuned microporosity, a specific surface area in excess of 1800 m2/g, and high capacitive performance. We obtained these carbide-derived carbon (CDC) materials via Cl2 etching of large titanium carbide particles at 800°C and subsequently annealing them with H2 at 600ºC. The carbon particles, which retained their coarse-grained structure, exhibited a narrow pore size distribution (dav=0.67 nm) that allowed for electrosorption of organic electrolytes and room temperature ionic liquids. Electrochemical testing using tetraethylammonium tetrafluoroborate (Net4+)(BF4-) solvated in acetonitrile showcased low ionic resistance, capacitance exceeding 120F/g (at 10mV/s), and high rate handling capability that allowed the material to store 60F/g at 1V/S charge/discharge rate. We evaluated the performance of this carbon material using 1-ethyl-3-methylimidazolium bis(trifliuoromethylsulfonyl)imide ((EMlm+)(TFSI-)) in neat and solvated configurations. Despite the viscous nature of the electrolyte, the material displayed over 110 F/g charge storage densities in a solvent-free state and 140 F/g while solvated in acetonitrile at 10mV/s sweep rate. Furthermore, neat RTIL electrolyte extended the voltage window of the material above 3.0 V, displaying little electrochemical breakdown and improving the materials operational capability and energy density. In addition to displaying high capacitance, dense, coare-grained carbon electrodes offer a less expensive supercapacitor fabrication approach and maximize the electrodes mass loading. We further explore the fundamental properties of his novel model system by mechanically milling or vacuum annealing the material to explore the influence of pore length and surface defects on fundamental properties of ion electrosorption in supercapacitors.